(Photo: Mikael Stjernberg / WCC)At a joint service in the Swedish city of Lund followed by a public event at the nearby Malmö Arena on Oct. 31, 2016, almost 500 years after the Reformation, Catholics and Lutherans apologized for their past divisions and conflicts, and pledged to deepen their common fellowship and service in the world. In a world of "my tribe", "my nation" and "my religion" first, the joint Catholic Protestant commemoration of the Reformation in Germany is a sign of unity the world can take note of say global church leaders. And when it comes to healing memories, the "power of forgiveness" can free up the way for the common witness that the world we live in desperately needs, the World Council of Churches general secretary has said. WCC general secretary, Rev. 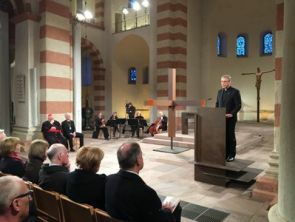 Olav Fykse Tveit, spoke at the ecumenical penance and reconciliation service in Hildesheim, Germany on March 11, which he praised as an "encouraging sign of unity in the world." The service was jointly held by the chairman of the (Roman Catholic) German Bishops' Conference, Cardinal Reinhard Marx, and the chair of the Council of the Evangelical Church in Germany (EKD), Bishop Heinrich Bedford-Strohm. The organizers said that this year, for the first time in history, the Protestant and Catholic Churches in Germany which split at the time of the Reformation 500 year ago are coming together for an ecumenical celebration of the anniversary. They said that this will for reconciliation would have been unimaginable in the past. On Oct 31, 1517, Martin Luther published his 95 theses protesting against abuses in the Church of his day, they said and this triggered the Reformation which was carried forward by Reformers such as Jean Calvin, Huldrych Zwingli and John Knox. Luther's criticism triggered the worldwide Reformation, which not only brought about the division in the Church, but also some extremely bloody wars. Protestants and Catholics used the subsequent anniversaries of the Reformation to condemn one another. 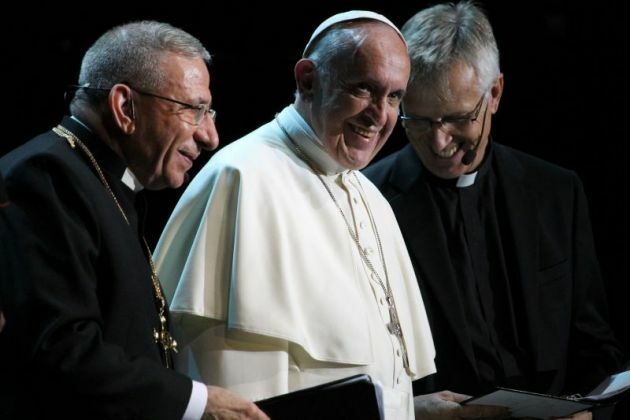 "This is moment of truth and is a decisive step towards the unity of the church," said Tveit in his message. "In the prayer of Jesus in John 17, we read that the unity of the disciples with one another is needed that the world may believe. "The world needs to recognize that we have seen and heard in Christ the presence of the true God," said the general secretary. His words of greetings was part of the historical coming together in 2107 of the Protestant and Catholic Churches that had split at the time of the Reformation 500 years ago. 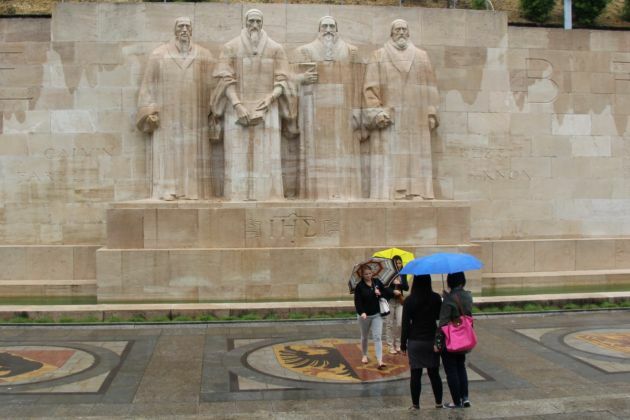 Catholic and Protestants have decided to share ecumenical celebrations of the Reformation anniversary during 2017 in different parts of Europe and the world, as well as in Germany. The service was held in St. Michael's Church on a symbolic site as it is Germany's second-oldest cross-denominational church, shared by Protestants and Catholics since 1542. German President Joachim Gauck and the German Chancellor Angela Merkel also attended the service that was broadcast live by national broadcaster ARD. Tveit noted that the truth frees people to walk together towards the future "and, with one another, to witness with still greater determination to the triune God of life". "Christians and churches in Germany witnessed to this truth of the love of God when, with their confession of guilt, they sought out the fellowship of churches in the World Council of Churches after the Second World War. "Christians and churches in Germany witnessed to the truth of the one humanity created by God, when they made possible the reconciliation of Europe and the fall of the Wall [separating the east and west of Germany at the end of the Cold War]." More recently, said Tveit, churches in Germany witnessed to the truth of love in supporting the "historic and necessary opening up of Germany to refugees". Tveit quoted Nobel Peace Laureate, Archbishop Desmond Tutu saying, "When you talk to the Germans, please tell them that the day Angela Merkel opened the boarders for the poor refugees, I was proud of being a human being." At the Hildesheim service Christians witnessed the "truth of God's grace and love" in seeking reconciliation with one another and cooperation in their common service for the world. "This is an encouraging sign of unity and fellowship for all churches in the world," said the WCC general secretary. Healing of Memories" is a pastoral-therapeutic procedure in victim-offender mediation. In recent years the term has also been applied to reconciliation between religious communities, cultures and ethnic groups, such as in Northern Ireland, Bulgaria, Hungary, South Africa Serbia and Bosnia-Herzegovina.